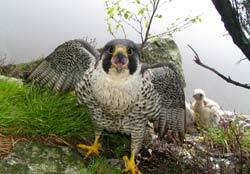 Federal Status: Not listed; Peregrine falcons are legally protected in New Hampshire. Possession and take (which includes harming, harassing, injuring and killing) is illegal. 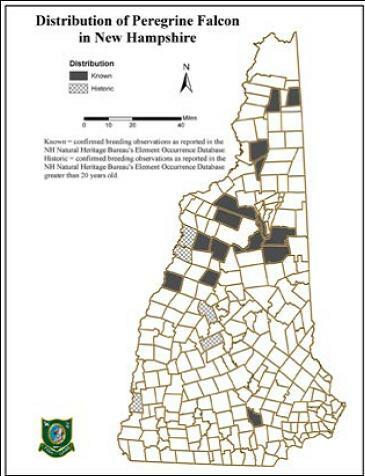 Distribution: Breeds mostly in the White Mountains, with a few further north and one to the south in Manchester. May be seen during fall migration which peaks in early-mid October. Description: 14-19” long with a 39-43” wingspan. Blue-gray back, barred white or buff color underneath, and a dark head with black sideburns. 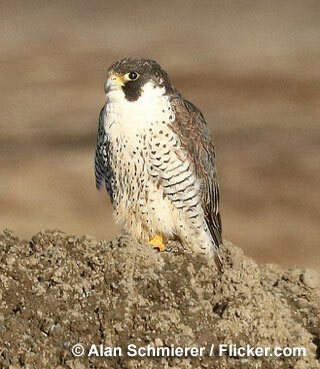 Commonly Confused Species: Merlins are similar in color but smaller in size. Habitat: Found in a variety of habitats, most with cliffs for nesting and open areas for foraging. Also found in large cities where it nests on buildings. 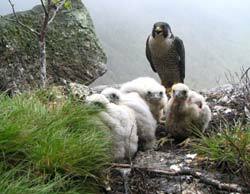 Nesting: Peregrine falcons begin breeding at one year of age and pairs mate for life. Females nest March - May and lay 2-5 eggs. Young hatch after about 30 days of incubation. Chicks are able to fly when they are 35-42 days old. 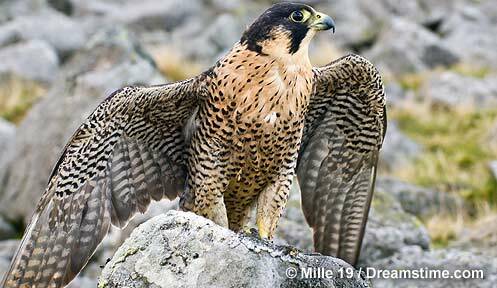 Diet: Peregrines feed mostly on medium-sized birds, but may also prey on small mammals and reptiles. It is a very fast flier especially in pursuit of prey which they catch in flight.